Cryptocurrencies are digital currencies that are encrypted (secured) using encryption methods, also known as cryptography. Bitcoin is the first cryptocurrency, powered by a public ‘ledger’ that records and checks all transactions chronologically. This is known as the blockchain. The success of Bitcoin has led to the creation a large number of other cryptocurrencies which are similar but serve different purposes. Cryptocurrencies you read about online or see on TV fall into 2 broad groups. You’ll usually see them grouped together but it’s important to understand the difference between coins and tokens. Altcoins simply refers to coins that are an alternative to the original Bitcoin. Many altcoins are a variation of Bitcoin, built using Bitcoin’s publically available structure with changes to its underlying code. This creates a new ‘coin’ but with slightly different characteristics. Examples of these Bitcoin-derived coins include Litecoin and Bitcoin Gold. Then there are other altcoins that weren’t born from Bitcoin’s structure but instead come from their own blockchain. Examples of these coins include Ethereum and Ripple. The similarity of all coins is that they each have their own blockchain to record transactions. Rather than having their own “blockchain”, tokens sit on top of an existing blockchain and they represent credit to access some kind of good or service in the future. Creating tokens is much easier than creating a new coin since you use a standard template that has already been created (like Bitcoin or Ethereum). Tokens are created through an Initial Coin Offering (ICO), which is a form of crowdfunding by selling tokens to fund a project. For example, an Australian based blockchain business called Power Ledger want to allow buyers and sellers to trade solar energy between one another via the blockchain. To do this they created a token on the Ethereum ledger. These tokens don’t give you any ownership in Power Ledger business but instead grants you part ownership of their blockchain network which may (or may not) be valuable one day. Power Ledger raised AU$34 million through it’s token sale in 2017 and it’s now worth over AU$500 million. If $500 million sounds like a lot of money for access to something that still faces some pretty significant risks including adoption, regulation and competition, spare a thought for Dogecoin. It was a joke cryptocurrency created in 2013 based on a dog meme and has no use at all. Dogecoin’s value hit a staggering US$2 billion in January 2018. To put things into perspective, that’s larger than Australia’s entire TV industry including Channels 7, 9 and 10. The name is funny enough, but coin's official logo looks like this. ICOs raised $6.8 billion in 2017, up from less than $150 million in 2014, 2015 and 2016 combined! People around the world are literally pouring billion after billion into digital coins and tokens each month. What is the difference between an ICO and an IPO (initial public offering)? While they might sound similar, ICOs and IPOs are very different beasts. An IPO is the public sale of the shares in a company for the first time, usually with the aim of raising funds for business expansion and growth. IPOs are highly regulated in Australia and require approval from the regulator, ASIC, as well as the ASX. To protect consumers, ASIC and the ASX have powers to block IPOs, and even when they are approved there are strict rules for advertising an IPO including the need for a detailed prospectus document to explain the risks to potential investors. When you invest in an IPO you receive shares in a business which gives you a claim on future profits and dividends as well as part ownership in the business if it’s ever wound up. Unlike an IPO, buying a coin in an ICO does not grant ownership of the business. Instead you get a form of “credit” that can be redeemed for products or services at a future date. Many ICOs should not really be described as “investments” since they do not give buyers actual ownership in the companies that offer them. It’s more like buying a voucher from a start-up company that gives you access to a discount on a product they hope to produce in the future. ICOs are not currently regulated in Australia, mainly because the rules haven’t caught up to this new technology. That means ICOs are not bound by any requirements to issue any form of legal documentation. However, to raise funds the common practice is for a document in the form of a white paper to be written up by the developing team to outline important information about the project, such as its purpose and how it works. Not being regulated means there have been quite a few ICOs that have been complete scams, including a large one recently called Bitconnect which crashed from being worth US$2.7 billion to worthless in a matter of days when it was discovered to be a ponzi scheme. There are now thousands of coins and tokens in existence and the one thing they have in common is they’re highly risky. Many, like Bitconnect, will turn out to be ‘pump and dump’ ponzi schemes. Some may have real value one day but just as many will end up being worthless, even if their technology and concepts are eventually adopted. Bitcoin and the cryptocurrency market has already experienced several ‘hype cycles’ where prices rocketed before falling 80-90% as the technology and adoption caught up with inflated expectations. One happened in 2011 and then another two in 2013. It’s always difficult to pick ‘peak excitement’ when it comes to speculation but some signs suggest we could be close to the end of another hype cycle. 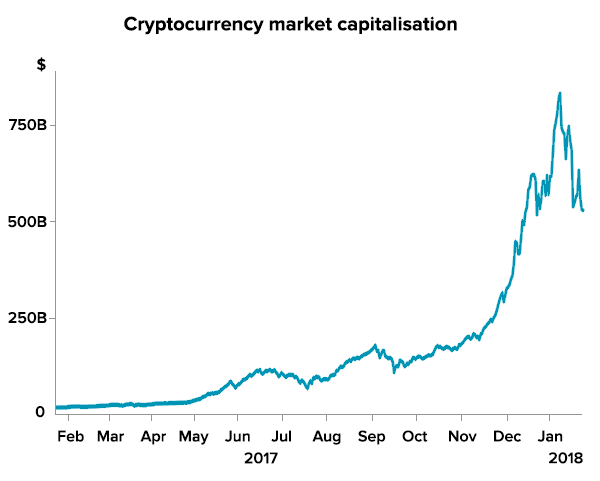 After reaching a value of US$830 billion in January 2018 (from $17 billion a year earlier), the total cryptocurrency market has already fallen 33% in 3 weeks and currently stands at around US$560 billion. That’s still up 3,000% from a year earlier and cryptocurrency “investors” are sitting on about US$540 billion of paper profits compared to a year ago. Even if the crypto market fell 80% from it’s highs it would still be up 1,000% from January 2017! What could make the cryptocurrency market fall 80% from the peak like it did in 2011 and 2013? ICOs have been a hot topic in the ASIC Digital Advisory Committee meetings I’m a part of and I would guess it’s only a matter of time before regulatory constraints are formalised to supervise the industry around the world. China banned ICOs in September as part of a broader crackdown on cryptocurrencies. Regulators in Hong Kong and Singapore have also warned against ICOs, citing fraud concerns and money laundering risks. The cryptocurrency sector today has some striking similarities to the dot-com bubble of 1997-2000. People are tipping billions of dollars into “investments” that have no revenue, profits or dividends, and those assets are rising in price only because others are also tipping money into them. As with the 2000 tech bubble, central banks have implicitly supported this type of speculation by maintaining low interest rates. Near zero interest rates encourages risk taking behaviour since there is very little incentive to leave money sitting in the bank. People simply have too much cash and don’t know what to do with it. Rising global interest rates is another catalyst that could cause an unwind in cryptocurrency and speculative activity in general. Considering cryptocurrency as an investment? Anyone looking to put money into cryptocurrencies should understand and fully expect their investment to fall 80% at some point even if the longer term trend is up. That’s just how a very typical hype/adoption cycle works. Ultimately better regulation and another reality check for cryptocurrency speculators (in the form of a market bust) would be healthy for the industry as energy will be transferred out of speculative activity and into the building real, innovative technology once again. That’s when Stockspot will be interested in exploring blockchain as a potential user – and in cryptocurrency as an investment adviser to our clients.